We have officially crossed the one week point of קיץ תשע״ה (Summer 2015), and what an amazing summer it has been so far! 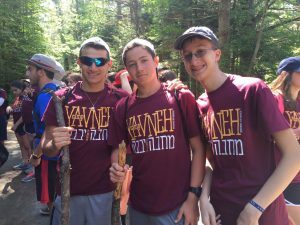 Tuesday was the first אחלה יום (trip day) of the summer and the עדה (unit) went on a new hike to Coppermine Trails in the mountains of New Hampshire. At the beginning of the hike, every חניך (camper) randomly chose another person in the עדה and a random word. Throughout the hike, that חניך attempted to get their person to say the word necessary. If they were successful, that person would be out and then the חניך would be given a new חניך. While no winner was crowned, the חניכים loved having a fun game to play on their hike. The day was completed with some delicious ice cream upon our return, and it truly was a wonderful טיול (trip)! On Wednesday, the חניכים, for the first time ever, were given the opportunity to plan their own פעולת ערב (evening activity)! After brainstorming many ideas, the עדה together decided on having ערב פיג׳מה (pajama night). 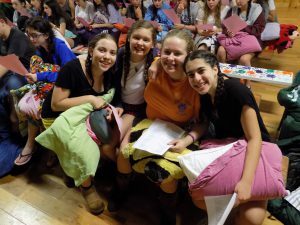 The night began with a fun version of musical pillows (musical chairs but with pillows) that included an intense final dance-off and show-down that resulted in a win by Elizabeth S.
Following her win, each חניך was given a partner and a list of questions. Each pair found their own quiet spot in the Ben Tzvi and had a DMC (deep meaningful conversation). After bonding with someone new in the עדה for the first time ever, the night ended with a viewing of the Israeli show מרחק נגיע (Touch Away) and then Kolbo! While camp is always awesome, the last few days have been especially fun and all the חניכים are having a great time!